This last summer, while the world held it’s breath about the American election, fans of “Archer” got a bit of satisfaction as the show was renewed for another three seasons. And so it was that, for the second year in a row, I met with almost all of the regulars of the humorously brutal animated spy/private eye sitcom, as well as the show’s creator, Adam Reed, who also provides the voice of fun-loving voice of sanity Ray Gillette. Like my last “Archer” chat held at San Diego Comic-Con, the interviews were done two at a time in super-fast five-minute stints. Alas, this meant that acting legend Jessica Walter deferred almost entirely to Reed. Similarly, ace farceur Chris Parnell lent brilliant but “you had to be there” comic support to Lucky Yates’s thoughts on voicing the lovably sinister Dr. Algernon Krieger. Happily, stars H. Jon Benjamin, Aisha Tyler, Judy Greer and Amber Nash were more easily transcribed. 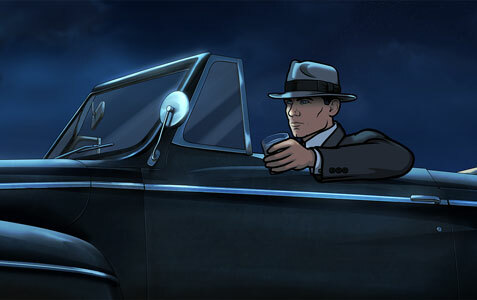 As for the new season, with selfish superspy turned self-involved private eye Sterling Archer last seen floating fully clothed and wrong side down in a Hollywood pool, “Dreamland” will take us into a season-long fantasia set in the film noir heyday of 1947. Presumably emanating from the not-quite-dead Archer’s brain and very definitely from the show’s new network home of FXX, the show premieres Wednesday, April 5th at 10PM. We are promised a great many noir references, the return of former guest star Jeffrey Tambor and no doubt phrasing and anachronistic references to Kenny Loggins. We can also reportedly expect a touching tribute to the long-suffering character of Woodhouse, formerly played by veteran actor George Coe, who passed away at 86 in July 2015, a few days after my first meeting with the “Archer” cast. Before he became the world’s second most famous spy novelist, literary master John le Carre famously disliked the world’s most famous spy (who never actually seems to spy much). He has said of James Bond that “you felt he would have gone through the same antics for any country really, if the girls had been so pretty and the Martinis so dry.” We can argue about whether or not that’s literally or just figuratively true of 007. 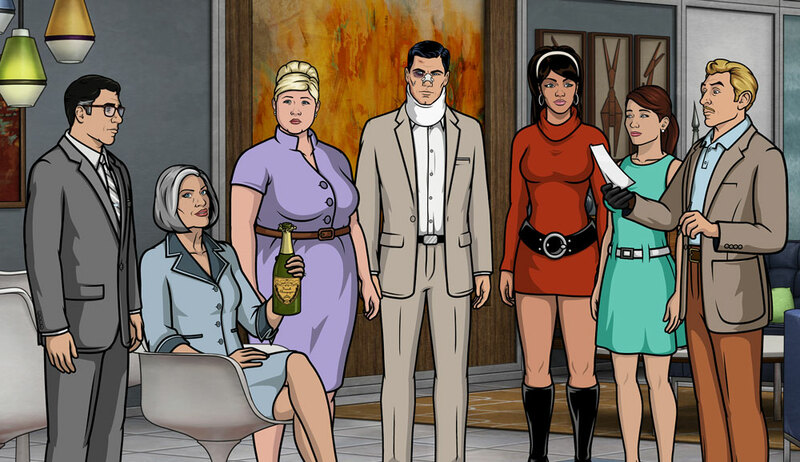 However, it’s very definitely the case if you’re talking about Sterling Malory Archer, the cocktail-guzzling, murderously self-centered yet oddly competent titular protagonist of “Archer,” Adam Reed’s blend of super-smart, reference-heavy, super-black comedy spy satire and frequently filthy animated workplace sitcom. If you’re a fan, like this writer, you’ll be delighted to know that the show returns to FX with its seventh season this Thursday night, March 31th. What follows are highlights of the conversations I was lucky to have or listen in on.